A ventriculostomy, also called an external ventricular drain (EVD) or ventricular catheter, is a catheter placed into the ventricles, fluid-filled spaces within the brain, and drains cerebrospinal fluid (CSF) externally. It is typically connected by tubing to a cerebrospinal fluid collection device which can be elevated or lowered at the bedside to vary the amount of CSF that is drained. 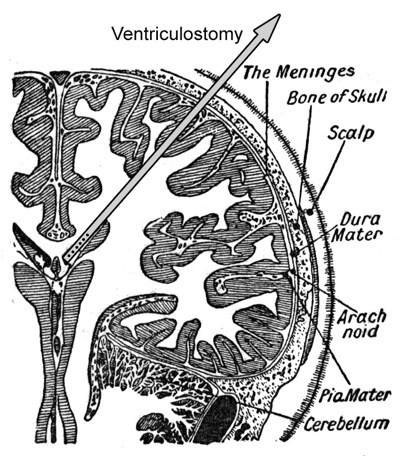 A ventriculostomy allows both draining and sampling of the CSF and also can be hooked up to a pressure transducer which gives a reading of intracranial pressure. Additionally, in some conditions certain medications may also be given directly into the nervous system by injecting them through a ventriculostomy. A ventriculostomy is typically placed at the bedside but sometimes is placed in the operating room. Typically, a small drill hole is made in the skull to allow introduction of the catheter through the brain and into the ventricle. Head Trauma: Patients who suffer traumatic brain injury often have increased intracranial pressure, the pressure within the head. This can be due to swelling and/or hemorrhage in the brain. High pressures can be quite damaging to the nervous system so physicians usually attempt to lower the pressure by several treatments. One of the most common is to place an EVD. This allows monitoring of the intracranial pressure and it also allows drainage of CSF to help lower the pressure if it is high. Hydrocephalus: Hydrocephalus is a general name for conditions in which there is an abnormality of the normal flow of cerebrospinal fluid within and around the brain and spinal cord. In many forms of hydrocephalus this leads to an accumulation of CSF which cannot be absorbed normally. While the long-term treatment of this condition usually involves some sort of permanent CSF shunting procedure, in acute cases a ventriculostomy may be placed in the hospital to lower the intracranial pressure. Surgery: Some brain surgery procedures are aided by draining some CSF from the ventricles. In these cases, an external ventricular drain may be placed at the start or during the procedure to drain fluid. Administering Medication: There are some conditions which may require the direct administration of medication into the cerebrospinal fluid. In order to do this, some patients may require a ventricular catheter which makes injection into the CSF possible. While these catheters can be used while the patient is in the hospital, some patients who need these treatments over a longer term may have a permanent catheter placed which is connected to a reservoir under the scalp. These are often called Omaya reservoirs. These types of treatments are occasionally used for some forms of nervous system infections and cancers.